Filed to: Stop the Feeling!Filed to: Stop the Feeling! Move over Socrates, there’s a new philosopher in town. 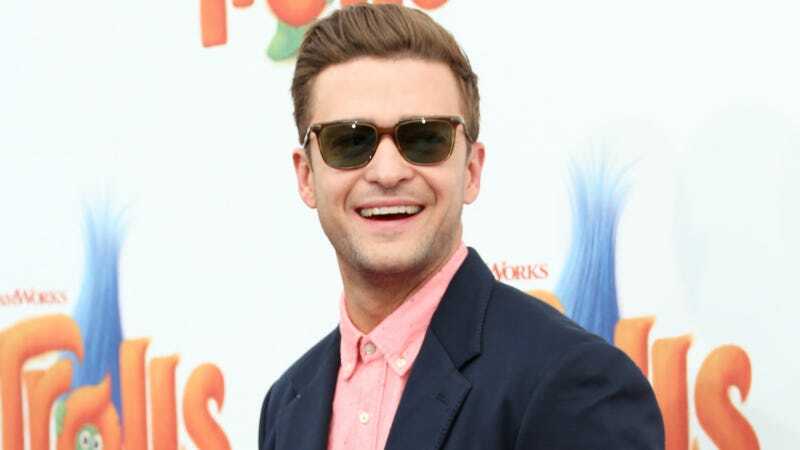 Elsewhere Timberlake describes appearing in the new, as-yet-untitled movie by Woody Allen (one of his “heroes”), an experience that “terrified” the pop star-turned-actor. He says making the Trolls soundtrack amounted to “putting some good vibes in the world” (strongly disagree!!!). He describes his upcoming album like this: “If [The 20/20 Experience] sounded like it literally surrounds your entire head, this stuff feels more like it just punches you between the eyes.” (Even figuratively, that is not what 20/20 sounded like. It was more akin to an insistent stream of water being poured over the cloth that’s sitting on your face.) He describes his “Can’t Stop the Feeling!” collaborator Max Martin as “music’s Morpheus” without explanation. Someone take away this guy’s blue pills. I mean, for real, what are we even doing? What is he even talking about? I’m confused, did he make people laugh and feel or was he just there for it? The piece is peppered with inexplicable investment in Timberlake’s potential. Clearly, Timberlake remains a beloved pop star, but the ability to sing while dancing does not a true renaissance man make. The piece’s writer, Andrew Barker, claims there’s “plenty of Oscar buzz” for “Can’t Stop the Feeling!,” because if there’s nothing people who take awards shows seriously care about more, it’s sugary Europop released months in advance of its soundtrack source so that it can stand alone as a potential Song of Summer. Jonathan Demme, who directed Timberlake’s recent Netflix concert special, claims that “Justin is right on the verge of his gigantic breakout movie.” Oh really? It’s been 10 years since Alpha Dog, and in the time since, Timberlake has tried hard to be a leading man in a variety of genres (In Time was sci-fi, Friends with Benefits was romcom, Runner Runner was an action thriller) to almost total viewer apathy. For every Social Network (in which Timberlake was adequate and all the acclaim felt like the result of him being graded on a curve), there are like five bombs that were almost immediately forgotten. (Incidentally, a planned narrative collaboration between Demme and Timberlake fizzled.) He’s not good actor! Or a good interview! But there are people out here donating organs, so whatever, who cares about any of this.